Navy and grey are usually recommended as the first sports-coat colours in a wardrobe for their suitability to different occasions, rather than to different trousers. Navy is the smartest of all colours, and with grey trousers can be almost as formal as a suit (with tie and black shoes); but it can also be pretty casual, with an open-necked denim shirt perhaps. Grey is never as smart, but if anything is even more versatile. From a pale cashmere (or Lamlana - angora/lambswool mix as pictured above from Steven Hitchcock) to a hairy tweed like the Elia Caliendo piece you mention. Navy can also go with a wide variety of trousers. There is the traditional mid-grey flannel or fresco. But I also find pale grey to be just as useful, if not more so. Then there is tan/beige. More unusual colours like brown and green. And cream, which goes with everything. Navy is easy because it is so dark. 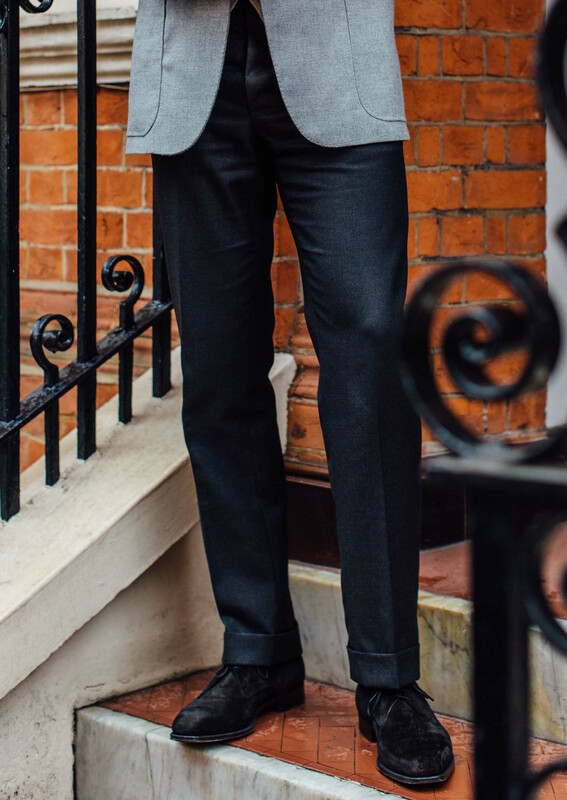 The first step in pairing a jacket and trousers is ensuring there is enough contrast between the two; because navy is so dark, the majority of trousers are paler and contrast is not a problem. Grey is never as dark, and rarely pale enough to be at the other end of the spectrum. It also suffers because it can rarely go with grey trousers. This is a big loss, because grey is a very versatile colour for trousers (in terms of occasions) for the same reasons it is in a jacket. It is subtle, conservative and supports strong colours well. As you imply in your question, navy odd trousers also rarely work. Their darkness means they nearly always look like the divorced half of a suit. However, all is not lost. First there is charcoal, as you mention in your question and as I’m pictured wearing here. It’s dark enough to work with any shade of grey, and is often best in a worsted wool rather than a woollen like flannel. There is tan/beige, which is fantastically useful group of colours. But you do have to get the shade right - there must be that sufficient contrast with the jacket. Good to have one darker/stronger tan and one paler beige in the wardrobe. And finally there are the more unusual browns and greens. I quite like these as trousers, even just for their rarity. I like brown flannel or Crispaire (as with my Caraceni jacket and as pictured above, while touring Dege & Skinner) and I like green flannel or linen. It sounds like tan/beige is the area you have yet to explore, but do give brown and green a go if you stumble across a pair you like. You can follow the discussion on Trousers to wear with grey jackets – Reader question by entering your email address in the box below. You will then receive an email every time a new comment is added. These will also contain a link to a page where you can stop the alerts, and remove all of your related data from the site. Simon and i agree on a lot of things but not his fondness for the preponderance of grey jacket and the charcoal trouser. because IMO they are not versatile. I have both items of course but they rarely see the light of day as there is almost always a better option, to me. Navy jacket on the other hand in different weights, finish, cut and style is arguably the most versatile item in any wardrobe. Great post, and a useful corollary to the earlier post on the same topic. A related geographic question: how much of a priority do you think off-white or pale cream trousers (pale enough to contrast with tan jackets) should be in the UK? I have seen plenty of good examples but mostly in pictures lit by Mediterranean sun rather than in the flesh here in the UK. Better to get more beige and brown options first? Something I often overlook until I catch myself is skin colour. It plays such an important part (especially in the UK where we can be quite pale most of the year!) in setting the palette for the clothes you wear. Not sure if Simon has ever discussed this or has any inclination to do so. I disagree with with you when it comes to navy trousers. Chinos, flannels, frescos, linen…if they have some texture they work well with pale jackets. I found them even more formal than the classic navy blazer+grey flannels. I’m thinking about the classic smoking ensemble of white/cream jacket with black trousers. This post explains why you should opt for a brown jacket instead of a grey one. You can wear almost the same trousers you would with a navy jacket and honestly brown is a way more interesting colour imo. The other problem with a light gray jacket is that the light jacket dark trousers combinations is harder to pull off instead of the usual dark jacket light trousers. It can be done nicely but more difficult. That does depend on your office. I regularly wear a brown tweed jacket in the office. I guess that’s the advantage of working somewhere where the stated dress code is a smart (suit and tie) but must people, including the bosses, actually dress more casually. Simon many thanks for taking the time to address my question in detail. Yes I totally forgot to mention that I do have tan and beige options. I do think that the charcoal trouser in worsted has a bit of the half suit issue, but definitely less so than navy. I guess the way to get around this is by playing around with the texture and going for wool, silk, linen blends, flannel, fresco etc. So yes, I personally feel I have more flexibility with navy, dark brown and dark green coats than grey. I think grey with a tinge of brown makes it more versatile…and if I vaguely recall that your Breanish tweed had that. Cream is indeed versatile but you run the risk of nautical or colonial connotations as you have alluded to before, and I guess cricketers and tennis players used to wear these in flannel a few decades ago. You may call me old school but I feel that light colours like cream or beige should be for Fridays or weekends and not early in the week if you are in a conservative city job. Thanks again! I have a pair of brown trousers that I pair with a navy jacket regularly. I like the combination – which was inspired by Simon’s navy jacket with brown fresco trousers pictured above. I do think a light grey jacket is harder to pair with odd trousers. Charcoal works and maybe a very dark brown. I often see light grey paired with black trousers which looks alright but is often matched to some truly ugly black shoes. Simon does having some pattern in the light grey make this pairing easier? To a certain extent, yes. It helps separate the jacket from the trousers if the contrast in colour is not that great. Perhaps there are more options than even with a navy jacket. But I’m not sure, due to the type of fabric in this case. Can you please explain the problem with navy trousers? Charcoal, and many greys, can also look like “part of a suit”, and IMO do not pair with tan/camel/mid-browns as well as navy does. This appears to be a British vs. American difference of opinion. It might be partly cultural, as many things are. But I think there is a fundamental issue that navy, being smarter and darker, more often looks like a divorced half of a suit, and is much harder to get right in any material. I rarely see it as an odd trouser, and even more rarely done well. I feel odd trousers are a little bit like ties. You can add some colour, you can add some contrast. At the moment I wear red trousers with a double breasted light tan jacket. I could have opted for bright green or mid blue as well. The only problem with dealing with odd trousers this way is that you would need as many as you usually have ties and this can get very expensive with bespoke trousers. Grey is a neutral colour (more so than navy) and makes a very versatile jacket colour. So I’d say a mid-light grey jacket is an excellent corollary to a navy jacket and I wear my mid-light grey jacket(s) a lot! Definitely worth considering one once you have a good navy jacket in your wardrobe – it is very versatile jacket colour and just that bit different from everyone else’s navy! Hi Simon, do you think a combination of light gray trousers and a darker grey jacket, with a houndstooth or herringbone pattern could work? Also, a Navy jacket with brown trousers work well, but a brown jacket with navy trousers? Considering the navy trousers had more texture (e.g. flannel). Thanks Simon. How does using cotton instead of wool change what you say on colour. For example do you see blue cotton trousers as different than wool? Here are some other colours to consider that I find that help one get past tan and grey , orange and duck egg blue. The material is part of the mix, which also includes weight, weave, finish etc. Generally a navy cotton is easier though, yes, as mentioned with the navy chino. I haven’t considered much brighter colours here – into which I would include orange and duck-egg blue. They tend to be less versatile and are a whole other area of discussion as to how to balance them in an outfit. If you don’t care about appropriateness, bright colours are in my opinion extremely versatile. Bright red trousers go with almost any jacket colour – blue, gray, tan, cream. I don’t need to follow dress code at work and I am under 30 and I wear shirt and jacket every day. With the use of bright colours I avoid being asked If I am going to a wedding. Navy jacket with grey flannel trouses looks too conservative and formal. I pair a grey check (blue checks) blazer with navy chinos, black chelsea boots and a blue button down collar shirt… however, I’m struggling to work out the most appropriate tie, would a navy grenadine be the easy answer here? I’m just not happy with the “look” with a grey tie but that may be because the grey isn’t dark enough to sufficiently contrast the blazer. Very interesting post and comment exchanges. Do you think a double-breasted cashmere navy jacket is as versatile as a single-breasted one or do you think it would look too “formal” with jeans for instance? I am thinking about having one made and would like to deviate a bit from my usual single-breasted jackets (though I don’t have a good classic single-breasted navy cashmere like your Solito jacket). Would something along the lines of your pale grey Cifonelli DB work (not in colour but in style)? I think a cashmere DB would certainly be too smart for jeans, yes. Even an SB could be – I wouldn’t wear mine with jeans, even in its Neapolitan cut. So if you exclude jeans (ie just wear it with flannels, etc. ), which style do you think would be a better choice from Cifo in your mind (knowing that all my jackets are SB but not having a classic SB navy cashmere)? DB it is then! Were you thinking his DB 6×1 (just ordered a suit in that style) or the same as the more classic DB 6×2 (like your pale grey one)? Personally I think that reference system makes no sense. In that style there are six buttons, of which two appear to close. It should be called 6×2 or 3×1. But I need to give up that particular mission. Wool is generally perceived to be wintry unless it’s lighter tropical wool or open weave stuff, say a fresco in light grey or beige, while cotton/linen is clearly summer. I guess weight, texture and colour determine summer vs winter. Is it okay to put together a combo where one part may have summery connotations and the other may have wintry connotations eg. The top cotton, bottom wool thing I refer to above, or wearing a challis/cashmere dark tie with a linen suit etc? Yes, that can work, and wool can work all year around. Any high-twist material like fresco in the summer, then there’s cav twills as well as flannel etc. I find the idea of a plain mid to light grey coat wholly bizarre. Mixing light coloured top to darker coloured bottom is not hard frankly, either in a Mediterranean inspired pastel combo, or a patterned/textured cloth for the coat (eg from the Glorious Twelth bunch) with anything from coral to lime, but the grey coat thing would be at the very bottom of my list of priorities, if it made it onto it at all. True Simon, but I had missed the office/formality point of your thread, so apologies for that, but a P&H would go with any more formal trousering in the flannel/worsted/twill/range across a wide range of colours. I just don’t see a flat gray as a colour for a coat. Just a little question: do you know how wide the lapels are, on your grey jacket from Elia Caliendo? Btw Simon, is there an upcoming review of your Steven Hitchcock jacket? The suit he made for me is probably the most comfortable thing I have (albeit still with a business connotation). It is less ‘staggering’ than my Maurice Sedwell suits (sharper cut, rolled sleeve-heads etc.) but perfect in a business context when you want to wear your jacket all day. The only thing I noticed is that the back would typically look less clean (ie quite far from the impeccable back shape of your very structured C&M suit) which I think is needed to achieve the level of freedom in movements of the ultra-drape cut. Did you have a similar experience? Please would you share the number for the Lamlana cloth from which Steven Hitchcock made your grey jacket? I cannot seem to find it on the W. Bill website; and, unfortunately, I do not currently have access to a tailor with the Lamlana bunch. Forgive me for emailing you directly rather than on the website, but my inquiry involves a tailor recommendation and I am sure that you would rather keep it private. I use Tony Martin and Benson and Clegg for my traditional British look. (You should visit him). I use Steven Hitchcock for the soft piece of the wardrobe and Leonard Logsdail for ultra-structured. My question involves the Italians. 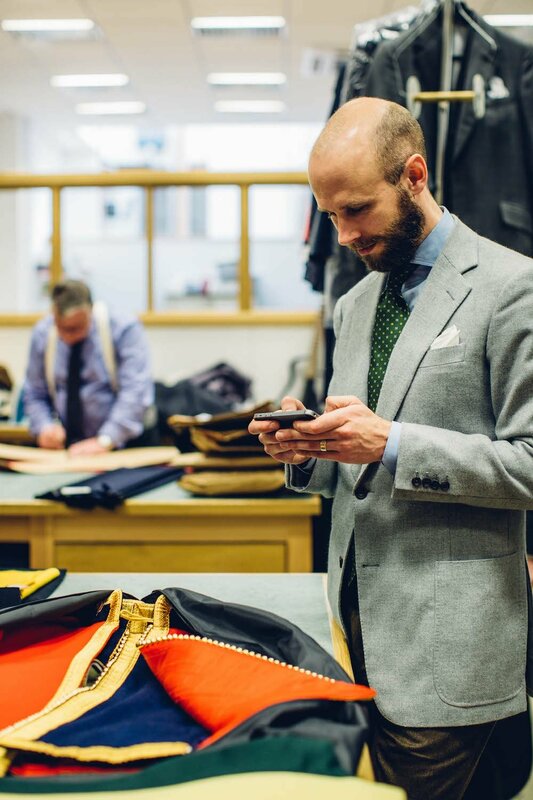 I have been using Sartoria Sabino from Naples and found them to be great. However I love their DB cut, but I am not as keen on their fake three single breasted. I want to know your thoughts on the Solito house cut and if you would recommend Solito or Rubinacci. (Solito is, of course, more economic). Thanks for copying this from your email. I do prefer these things on the site so everyone can see them. As it relates to Solito, I have read that you can request the cutting style of the father, Gennaro, rather than the tighter fit of the son, Luigi. As I am in New York, it is Luigi who travels and will be cutting the fabric. Is is safe to request Luigi cut a looser garment a la his father, though it may be contrary to his own persuasions? You can certainly request that, yes, and easily prescribe it at the fitting. What pants will you recommend to match with a pale grey fresco jacket? Cool. How about the which sports jacket will you recommend to match with a pale grey fresco pants then? I already have got a Navy Hopsack. thanks for a good site with lots of valuable information. I have recently had a Boglioli K-jacket made in a grey herringbone pattern with dark brown buttons hoping it would be really versatile, and look somewhat like your caraceni cashmere jacket colourwise but more informal. Unfortunately I put to much emphasize on having a herringbone pattern, a rather small and speckled herringbone with light, mid and very dark grey, and perhaps too little on the overall tonal impression. The overall impression is rather darker than what would perhaps have been optimal, just a bit darker than what john smedley refers to as charcoal in their knitwear (which really is bit light for charcoal, isn´t it?). Now I´m a bit at a loss for suitable trouser colours. I´m hoping to wear the jacket as an allround jacket which could be dressed up with perhaps a grenadine tie and down with a wollen tie or without just an open necked shirt. Light grey trousers would probably work, and hopefully jeans but any other suggestions would be very welcome. Oh, shoes would probably be brown suede chuckas, dark brown oxfords from G&G (too sleek? ), kind of reddish brown less sleek oxfords or double strap monks. Black chuckas, or tan chelsea boots are also be available. And a pair of G&G dark brown split toes are in the pipeline. I’ve been searching your site for comments about black trousers, whether chinos, worsted, or something else. Are black trousers of any kind even more taboo in your view, worse than navy? The thing is, I see black pants used widely in fashion, perhaps more so in more modern tailoring and street clothing? I’d appreciate your thoughts on black. I also wonder about charcoal. Black is worth avoiding pretty much anywhere except in black tie. It’s worn in fashion but never really looks elegant in the day. Charcoal, on the other hand, is a menswear staple and you should definitely have a pair. Particularly useful with grey jackets, as discussed here. 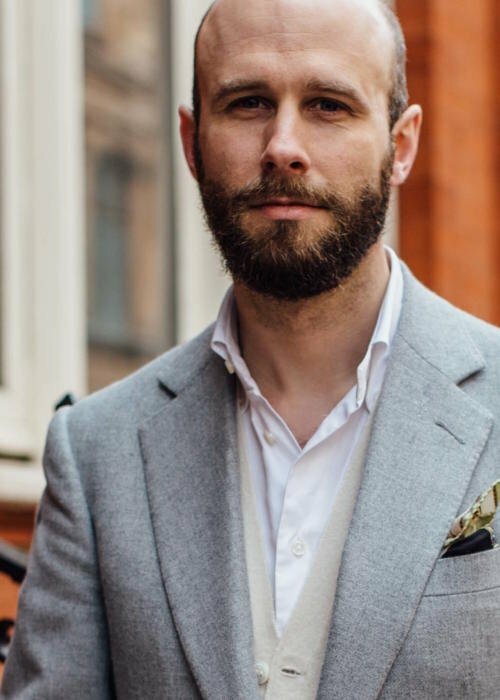 Hello – For an odd light to mid grey unstructured jacket to pair with chinos and tailored trousers, what material would you recommend? I am thinking of hopsack, with patch pockets, but it may not provide texture enough. A lot of things could work Rui. What jacket, and how smart? Sorry I missed the office/formality point Simon. I was referring to a light grey jacket (salt and pepper) for a non-too strict office. With cream, I would generally go with a blue shirt to soften the contrast of the trouser, and perhaps a dark knitted tie, eg brown or charcoal. On a more casual approach what trousers would you recommend with the said light grey jacket with an indigo shirt? Or conversely, which jacket with cream trousers and indigo shirt? For the cream trousers/ indigo shirt combination would a navy blue jacket do? Or a tobacco suede blouson? Thank you Simon. Did a quick test on both proposed combinations and the navy one really works. The loudness of the check makes it very hard to match and the best I’ve been able to come up with it is wearing it with navy chinos and a plain blue oxford shirt, or navy chinos and a cream roll-neck sweater. Do you have any other suggestions? Have I managed to pick an ugly fabric? I think the fabric’s nice. How about charcoal trousers, probably worsted but also maybe flannel? Thank you Simon, I’ll give that a go.